There are really only two occasions where a modern Western woman is likely, even expected, to wear a veil. One is when she is in mourning or attending a funeral. The other is on her wedding day. The history of the wedding veil dates back to biblical times and there are numerous interpretations of its symbolism. One popular interpretation is that the veil represents long, flowing hair, which brides used to wear down their backs to symbolize chastity. Another traces it back to the early Romans who used it to protect the bride-to-be from evil spirits on her big day. Yet another story swears that the veil was used to hide the bride's face so that the groom at an arranged marriage couldn't back out if he didn't like what he saw. Remember, the veil is only lifted after the couple is pronounced man and wife! But whatever its origin, the wedding veil remains an important accessory in most Western weddings. In this article, we will review a few basic tips that will hopefully help you select the perfect veil. Traditional wedding veils were made from tulle, but lace, satin and silk have become increasingly popular options. Additionally, many veils are now adorned with pearls, crystals, rhinestones or embroidery. The length of the veil often depends upon the length of the bride-to-be's hair. Brides that want to showcase their professional hairstyle often choose a veil that fastens underneath their coiffure. As you might expect, shorter veils are more manageable, which makes them the only choice for brides who choose to wear them throughout the entire event. As mentioned, if you plan to wear you veil for hours on end, it should be light and short. But if you are planning on wearing it only at the ceremony, it may be a good idea to go all out. Long, flowing veils are called cathedral veils and they descend about 3.5 yards from the headpiece. The shorter, more functional veil is called a blusher and it is the popular choice for warm weather weddings. Many brides make the mistake of removing their veils immediately after the ceremony. To ensure that this classic accessory appears in most of the pictures, it is important to leave it on until after the first dance. As important as the wedding veil is, remember that it is just an accessory. And as such, it should never overshadow your wedding dress. Rather, it should complement it. As a general rule, the more elaborate the gown, the less elaborate the veil. The less formal your ceremony, the less formal your veil should be. An outdoor ceremony on the grass or sand will likely include a fairly informal dress, which means that you will want an informal veil, like a blusher or a flyaway. Unlike your shoes, the veil does not have to match the color of the wedding dress exactly. In fact, most brides prefer veils that are a shade or two lighter or darker than their gowns. In general, however, a bride-to-be should not choose a veil that is a different color from her dress. It will detract from the gown, which should rightly be the center of attention. The average veil costs about as much as the average pair of bridal shoes. According to a recent survey, the average price is $274. Of course, there are adequate wedding veils that can be purchased on the cheap. For less than fifty dollars, the frugal bride-to-be can find a short, one-layer veil that is made from either netting or tulle. For $150 and up, she should be able to locate a fingertip-length tulle veil that has a few embellishments, like ribbon, embroidery or pearl trim. Finally, for $300 and up, a bride-to-be can purchase a multi-layered veil of almost any length that is adorned with lace or beads and is made of high-quality silk tulle. 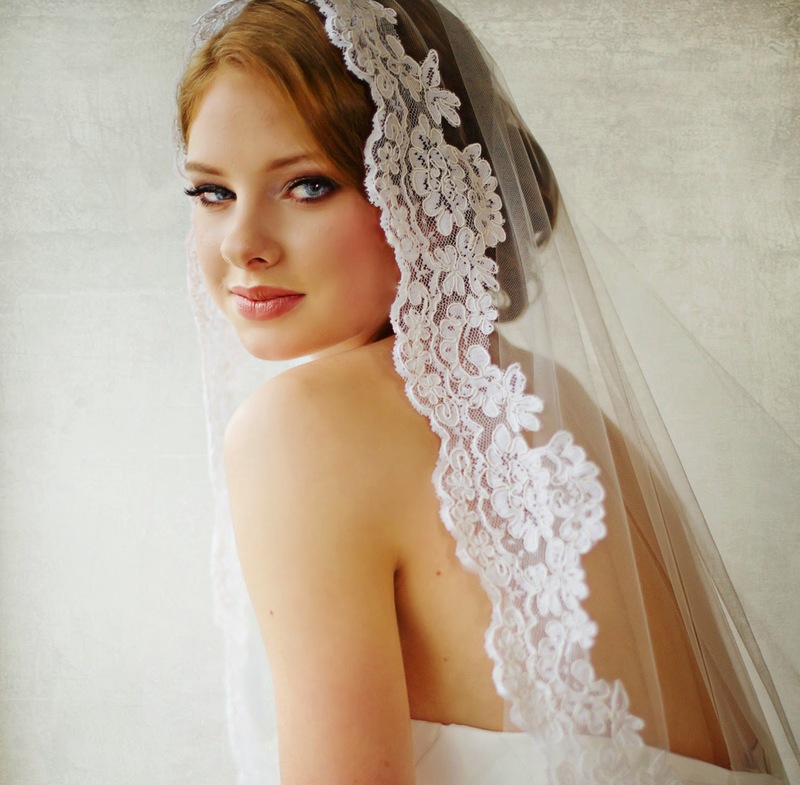 We will now take a moment to review the most popular styles of wedding veils. 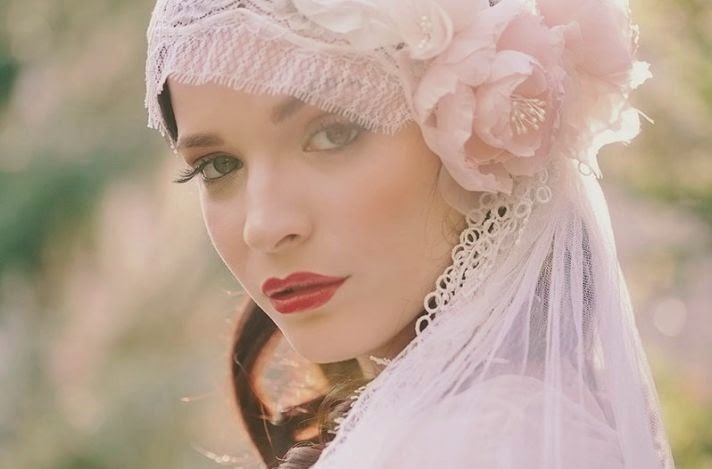 Easily the most popular and most informal veil, the blusher is a short, single-layer accessory that is worn over the bride's face during the ceremony and then flipped back before the kiss. The most formal of the casual veils, the flyaway is a multi-layered, shoulder-length veil that is light enough to be worn at warm weather weddings. As you may have guessed, this formal accessory reaches all the way down to the bride's elbows, but does not overshadow the dress. It is actually quite popular for casual weddings. Another obvious anatomical appellation, the finger-tip veil falls all the way down to the bride-to-be's finger-tips when her arms are handing naturally. It is a formal veil that is often only worn as an accessory to elaborate ball gowns. Also called the royal veil, it is the most formal of all wedding veils. When left to fall naturally, it extends a full 3.5 yards from the headpiece and is often worn with a cathedral-length train.